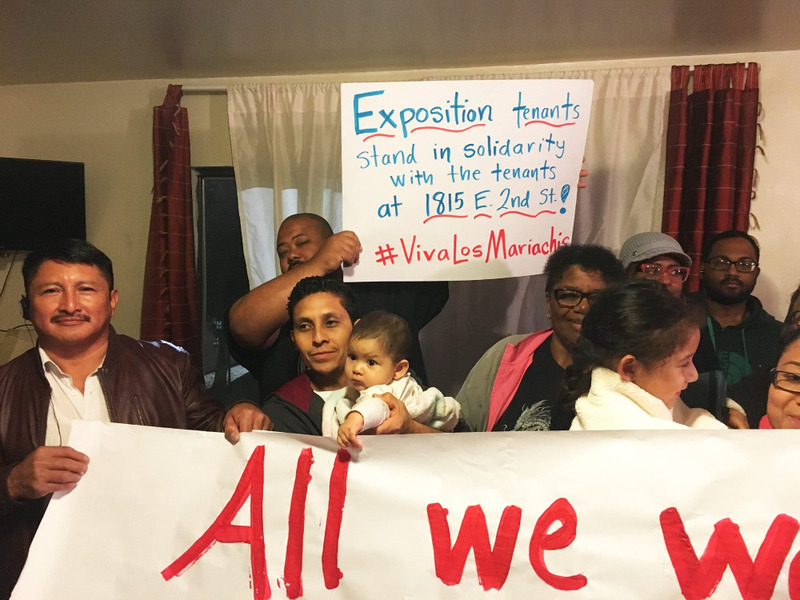 Help us Stop the Exposition Evictions! Imagine waking up one morning to a notice that says that your landlord wants you to give up your apartment to make way for USC students. This is what happened to the working class families living in seven buildings along Exposition Blvd near USC. On September 29th, 2017, seven buildings on the same block were purchased for $8.5 million by Kim Chung Suk and Kim Hae Jung. Almost immediately, all tenants living in the buildings were given 60 and 90 day notices to vacate the premises. 70 people, almost exclusively working class people of color, live in these buildings. Among the tenants are disabled adults and children, including two stroke survivors, and an elder suffering from cancer. Many families are on Section 8 and others are on the county's transitional housing "pilot" program. These tenants represent the heart of South Los Angeles. This is their community and we need to fight for their right to stay in their neighborhood! If the Exposition evictions proceed, the displacement of an ENTIRE BLOCK of working class people of color will be complete! Support the tenants in their fight to stay in their homes. Help them defend the Human Right to Housing! Donate to their fund to support the tenants and their legal costs! ¡Ayúdenos a detener los Desalojos de la Exposición! Imagínese despertar una mañana a una nota que indica que el propietario quiere que usted renuncie a su apartamento para dar paso a los estudiantes de la USC. Esto es lo que le sucedió a las familias de la clase obrera que viven en siete edificios a lo largo de Exposition Blvd, cerca de la USC. El 29 de septiembre de 2017, Kim Chung Suk y Kim Hae Jung compraron siete edificios en el mismo bloque por $ 8.5 millones.Casi inmediatamente, todos los inquilinos que vivían en los edificios recibieron avisos de 60 y 90 días para desalojar los locales. 70 personas, casi exclusivamente personas de color de clase obrera, viven en estos edificios. Entre los inquilinos se encuentran adultos y niños discapacitados, incluidos dos sobrevivientes de accidentes cerebrovasculares y un anciano que padece cáncer. Muchas familias están en el programa Sección 8 y otras están en el programa "piloto" del condado, un programa de vivienda de transición. Estos inquilinos representan el corazón del sur de Los Ángeles. ¡Esta es su comunidad y debemos luchar por su derecho a permanecer en su vecindario! Si prosiguen los desalojos de la Exposición, se completará el desplazamiento de un BLOQUE COMPLETO de personas de color de la clase obrera. Apoye a los inquilinos en su lucha para permanecer en sus hogares. ¡Ayúdalos a defender el derecho humano a la vivienda! ¡Ayúdenos a recaudar dinero para apoyar a los inquilinos y sus costos legales! 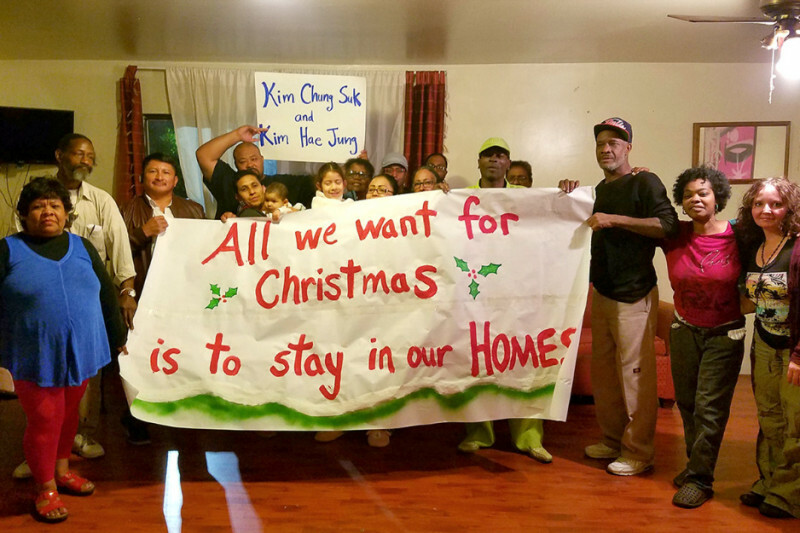 Yesterday afternoon, right in time for Christmas, 10 Unlawful Detainer Evictions were served to different tenants in the Exposition Blvd struggle. The lawyers representing the owners are none other than the very same law group representing BJ Turner against the Mariachis. Solidarity Forever from the Southside to the Eastside. Please help support the Exposition Tenants by sharing this GoFundMe and donating to the fund for their legal fees. Hello Everyone! The Exposition Tenants Association and the South LA Local of the LA Tenants Union would like to express our deep gratitude for all your generous contributions! In the coming days, we'll update y'all on how this struggle is shaping up and other ways that folks can plug in. Thank you also to those who have shared the campaign online! Please do continue to share amongst your friends. If you've got contacts at USC help us spread the word amongst those folks too! Lets continue to send a message to these landlords and to USC: We will not stand for the displacement of people for profit!